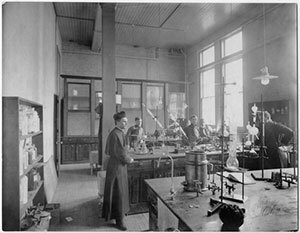 The University of Notre Dame’s College of Science will celebrate 150 years of science at Notre Dame beginning this month through September 2015. The college will host numerous events throughout the year in collaboration with the local community and national sponsors. The Center for History will offer a year-long exhibit, “From Astrophysics to Zebrafish: 150 Years of Science at Notre Dame.” Focusing on Notre Dame’s history of scientific research and education, the exhibit includes artifacts of early scientific lab equipment, fossils and photographs of legendary Notre Dame scientists and their discoveries. The exhibit is open to the public through Aug. 2, 2015. Admission is charged. Undergraduate and graduate students in the College of Science will challenge and educate more than five hundred middle school and high school students Friday, Sept. 12, through hands-on experiments and activities at a Shamrock Series. event, “Let’s Have a Moment of Science” at the Children’s Museum of Indianapolis. Notre Dame biologist Jennifer Tank, astrophysicist Justin Crepp and Director of In Vivo (biological) Imaging W. Matthew Leevy will give talks at 10:30 a.m. which will be simulcast. The event is open to the public; admission is covered by the generosity of a benefactor. The inaugural event of the 2014-15 Notre Dame Forum will feature Carl Wieman, recipient of the Nobel Prize in physics and professor of physics at Stanford University. Wieman will present “Taking a Scientific Approach to Science Education” at 7 p.m. Monday, Sept. 15, at the Leighton Concert Hall in the DeBartolo Performing Arts Center. Wieman will examine the discrepancies in the advancement of science compared to advances in science education, and how recent research is setting the stage for a new, more effective approach to teaching and learning. Rebecca Wingert, Elizabeth and Michael Gallagher Assistant Professor of Biological Sciences, and Michael Hildreth, professor of physics, will serve as moderator and commentator, respectively. The event is free and open to the public. The College of Science will host Science Week October 6–11 with several events, including a national ACS on Campus conference hosted by the American Chemical Society Oct. 7 and 8. Other events include an astronomy night for students, a show in the Digital Visualization Theater, a lecture by Rice University chemist Peter Wolynes on protein folding and a “Math for Everyone” lecture by Joshua Cooper, associate professor of mathematics at University of South Carolina, followed by a phylogenetic tree competition at Potawatomi Zoo. The final event will be a public demonstration to celebrate National Chemistry Week in the Jordan Hall of Science Saturday, Oct. 11, at 10 a.m.
Ira Flatow, host of the national radio show “Science Friday” will deliver a lecture Monday, Oct. 13, at 4:30 p.m. in Washington Hall. The radio show will be taped at 7 p.m. on Wednesday, Oct. 15, in the Leighton Concert Hall at the DeBartolo Performing Arts Center to be broadcast on National Public Radio stations throughout the country. Tickets will be available at the DeBartolo Performing Arts Center. “We’re thrilled to commemorate this significant milestone in Notre Dame history. We are proud of the accomplishments of our students, faculty and staff. Over the past 150 years our college has made a significant impact on our community, the nation and the world. We are excited about the future influence our students, faculty and staff will make across the globe,” said Gregory Crawford, the William K. Warren Foundation Dean of the College of Science. Throughout the year, special events celebrating 150 years of science at Notre Dame will be added to the event website. Originally published by Marissa Gebhard at news.nd.edu on September 10, 2014.